Rig-a-Jig-Jig is a Norfolk Music History Project and a Country Dance Band. We put on a variety of live events, mainly in Norfolk but also in other parts of East Anglia. 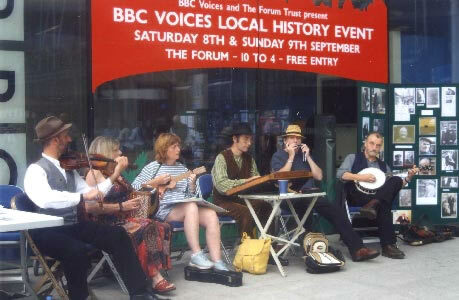 We collect information, photos and recordings of the traditional music of Norfolk. If you have memories of the old music, we'd love to hear from you and maybe arrange to interview you if possible. To see our latest project news go to our new dulcimer page! The picture above is of the band itself but we also do 'and friends' events featuring songs, monologues and stepdancing. We have produced CDs of archive recordings and of ourselves.